The Eure (English: /ɜːr/) is a river between Normandy and Centre-Val de Loire in north-western France, left tributary of the Seine. It rises at Marchainville in the Orne department and joins the Seine near Pont-de-l'Arche. Two departments are named after the Eure, namely Eure and Eure-et-Loir. ^ a b "Eure River - river, France". Encyclopedia Britannica. Retrieved 17 February 2019. ^ "Sandre Portail national d'accès aux référentiels sur l'eau - Fiche cours d'eau". services.sandre.eaufrance.fr. Retrieved 17 February 2019. 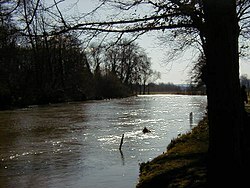 Wikimedia Commons has media related to Eure River. This page was last edited on 17 February 2019, at 05:36 (UTC).